Another SRQ post! The April issue features, in addition to several Sarasota wedding photographers :-), the annual readers awards, “Best of SRQ Local.” A handful of other photographers and I were asked to capture voters with their picks – This is the first year SRQ has added this twist, and it was really fun to meet the local voters and hear about their favorite spots. Check out the other winners, contenders, and voters in the April 2011 issue of SRQ! Sarasota Wedding Photographers in SRQ Magazine! 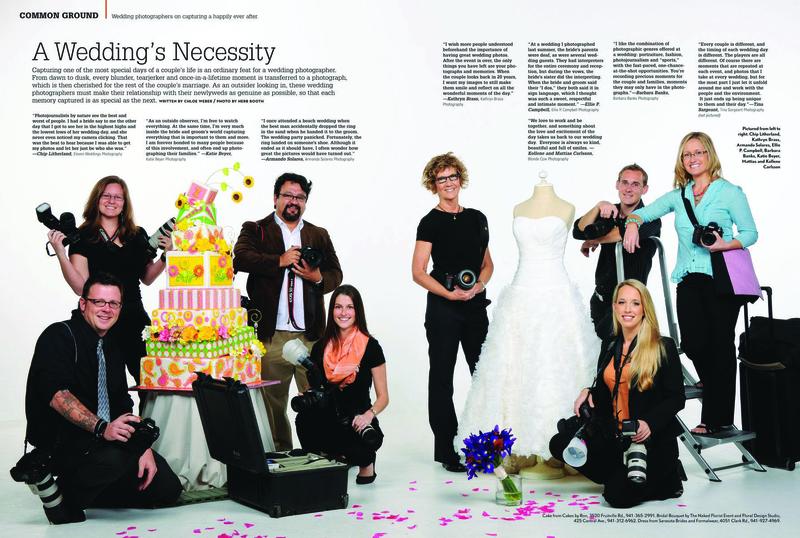 SRQ Magazine featured a spread on some wedding photographers in the April issue (out now) – Check it out below! Thanks to photo editor Cat Pennenga, photographer Herb Booth, and everyone involved in the shoot for making it fun and painless! It was interesting, somewhat uncomfortable, but also a good time to be on that side of things – and I was honored to be alongside such amazingly talented photographers, everyone with their own unique experience and style. Edible Sarasota’s summer issue – out now! More on both of these to come. Pick up a copy at Whole Foods (where you can also get a jug of Dakin milk) and other locations. Congratulations to the team at Edible Sarasota for another awesome issue! I’m very proud to be part of such a great magazine, mission, and group of people. Whoop whoop! (or, as my mom would say, “Woof woof!”) – got on TasteSpotting again! This time for the dairy-free coconut chocolate pudding recipe (on a buttery shortbread cookie, but that’s optional for those who don’t tolerate or aren’t interested in dairy) – thanks once again to Heidi Swanson and her very useful 101cookbooks.com. When Tracy asked me if I could stop at Mote Marine to get some shots of their caviar, I was excited. I envisioned going to their laboratory and aquarium just off of St. Armands Circle, photographing caviar being placed into jars or on an elegant platter… Then I got an email with a video showcasing what I would be shooting (which I won’t share here) as well as the location – several miles out into the middle of nowhere (i.e., east of I-75) at their aquaculture park, where they raise Siberian sturgeon. Now I was envisioning a place reeking of fish insides (and out in the wilderness, far from the safe, child-friendly atmosphere of the dolphins and starfish of Mote’s aquarium). Eek. “What did I get myself into? !” I yelled aloud (really, I think I did – and I was alone). I was scared I wouldn’t be able to handle it. I don’t like the smell of fish, let alone their insides. I wanted to do it anyway – experience something new. Worst that would happen is I’d pass out face first on the cold, hard floor. It’s happened to me before (hence the scar from 22 stitches on my chin). Although I would not want to repeat that escapade – especially with the risk to my camera! – I was hoping I’d end up somewhere in between my first vision of the shoot and the stretcher and stitching. And the aquaculture park itself is a welcoming facility dedicated to sustainable fish farming and research. As for my worries of the aroma… The caviar-harvesting room is kept at a chilly 30-ish degrees, and it has a faint fresh, salty scent. It’s also impeccably clean; I wasn’t allowed in the room before suiting up and scrubbing down as if I were going into surgery. So, phew! 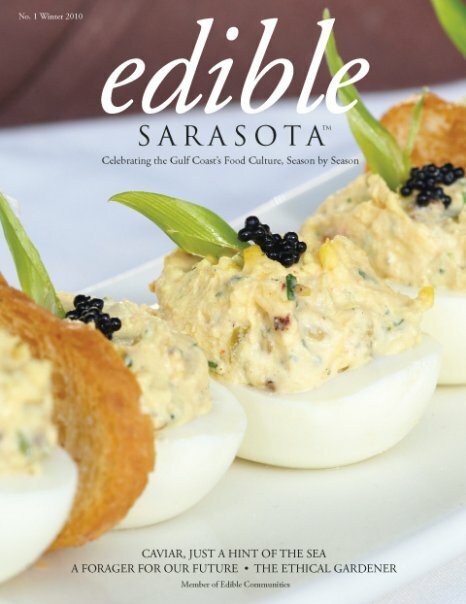 And here is a link to the article written by Lael Hazan in Edible Sarasota, in which she provides information on fish farming, the process of preparing, serving, and eating caviar, and where to find and eat Mote’s caviar in the Sarasota area, such as Libby’s, whose deviled eggs dish topped with the Mote caviar was featured on the cover of Edible Sarasota.